The most promising hair loss research in recent times has been in the area of janus kinase inhibition, commonly known as JAK inhibitors. The JAK-STAT pathway concerns cells used by signalling proteins known as cytokines to help control various functions in our bodies, including immune and inflammatory responses. 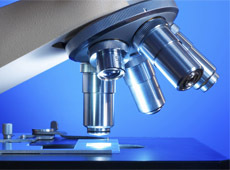 By testing various different drugs from the suite known as JAK inhibitors, clinical trials have found that some are so far appearing effective at treating autoimmune conditions including the most severe and currently untreatable forms of Alopecia Areata – Alopecia Totalis and Alopecia Universalis. Though trials are still ongoing to ensure the drugs meet the necessary safety, efficacy and tolerability standards required for any new drug or medication, an estimated release date of 2020/2021 was recently announced. 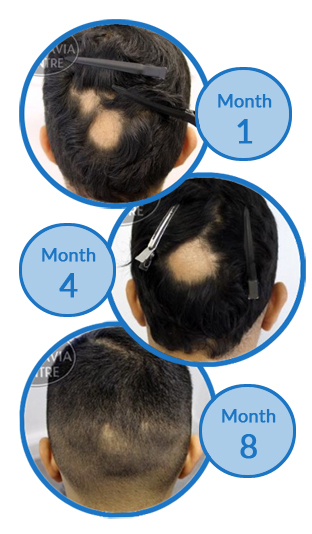 Now, adding further momentum to these JAK inhibitor developments, the Trustees of America’s Columbia University School of Medicine in the City of New York – which has been at the forefront of this research – has been granted two patent applications for specific JAK inhibitor drugs by the United States Patent and Trademark Office (USPTO) for the treatment of hair loss and for inducing hair growth. This information was released on April 4th 2017 by pharmaceutical company Aclaris Therapeutics Inc, to whom Columbia’s Trustees have exclusively licensed these rights. The company has previously stated that it would be making a ‘strong commitment‘ to developing JAK inhibitor hair loss treatments. Researchers first discovered that JAK inhibitor drugs, when taken orally, could regrow hair in cases of baldness from autoimmune conditions – first Alopecia Universalis, then later Alopecia Totalis – in 2014. This came about after a patient being treated for plaque psoriasis at Yale University School of Medicine was given the Pfizer rheumatoid arthritis drug Xeljanz – active ingredient, the JAK inhibitor tofacitinib citrate. A 25 year old male was treated for this chronic immune-mediated skin disease for eight months. He followed a course which involved taking 10mg of tofacitinib citrate per day for two months, then 15mg of the drug each day for a further three months. Whilst the Xeljanz showed only ‘mildly effective’ results in terms of improving his skin condition, the man – who had been completely bald with no body, facial or scalp hair for the past seven years due to Alopecia Universalis – completely regrew his hair whilst following the course. Not only did he regrow hair on his scalp but also he also started to get his eyelashes, eyebrows, facial and body hair back. Incidentally psoriasis, Alopecia Universalis and rheumatoid arthritis – the condition tofacitinib citrate was designed to treat – are all classed as immune system disorders. Concerns regarding the seriousness of the potential side effects of Xeljanz were already well established so the drug was tested topically as well as orally to try to minimise these risks. From this point onwards various other JAK inhibitors were also tested – both orally and topically, as well as in various strengths – to determine their potential suitability as treatments for hair loss, predominantly in the autoimmune area of Alopecia Areata. The team from Columbia University School of Medicine in the US, led by top hairloss researcher and former Alopecia Areata sufferer Dr Angela Christiano (pictured), appears to have been working tirelessly on finding an alternative. American biotechnology company, Aclaris Therapeutics, Inc. (ACRS) now has exclusive rights to these two drugs – and not just as treatments for Alopecia Areata in its various forms. Although the majority of information on clinical trials on JAK inhibitors for hair loss has so far concentrated on autoimmune alopecia, the new patents cover the use of these drugs for both Male Pattern Baldness and the women’s equivalent, Female Pattern Hair Loss, too, as well as other ‘dermatological conditions’. “We are extremely pleased with this expansion of the patent portfolio we exclusively licensed from Columbia. These allowances expand the breadth of and further validate our JAK inhibitor intellectual property portfolio covering methods of use for certain JAK inhibitors for the treatment of hair loss disorders. The allowance of these patent applications is another step towards the development of a robust portfolio relating to JAK inhibition and hair loss,” said Dr. Neal Walker, President and Chief Executive Officer of Aclaris. 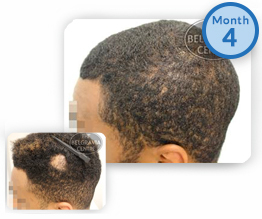 Whilst this news and the drugs’ potential, should they pass the necessary tests needed to be made widely available for prescription, is incredibly exciting – especially for people whose hair loss conditions have had no viable treatment option previously – there are currently effective treatment methods available for some of these types of alopecia. Androgenetic Alopecia – better known as male and female pattern hair loss – has MHRA and FDA approved treatments available now. 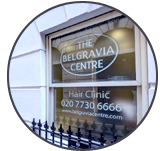 At Belgravia, a range of components go into each client’s personalised hair loss treatment courses which feature clinically-proven medications designed to prevent further hair thinning and promote regrowth. Additionally, for those experiencing sudden, patchy hair loss of the scalp only, alopecia areata treatment courses can be tailored to the client’s needs in order to accelerate the hair growth process. For anyone concerned about either of these issues even just knowing that there is support and treatment available now, without having to wait, can be extremely comforting. Hopefully those who do not have these types of options available to them due to the nature of their particular condition will soon have access to solutions and a similar feeling of relief, too.